Below are some FAQs for our New Orleans Garden District bed and breakfast. 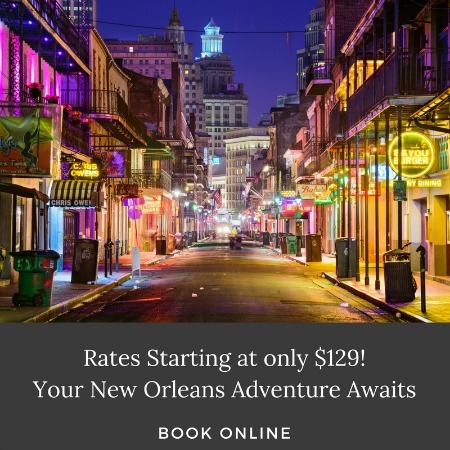 If you do not find an answer to a question you have about lodging near the French Quarter in New Orleans, LA, please call us at (800) 977-0008 or (800) 977-0008. Where is the Grand Victorian located? We are located in the historic Garden District area of New Orleans at the corner of St. Charles and Washington Avenues. Because of our central location, 15 minutes can get you anywhere you want to go. Located within 27 blocks of the city’s main attractions, you can get to the French Quarter or the university section of town via the St. Charles Avenue Streetcar Line. Walk 1 1/2 blocks to Commander’s Palace restaurant for a fabulous meal, across the street to the Lafayette Cemetery, or stroll 4 more blocks to the “shopper’s paradise” along Magazine Street. What is the parking situation if we have our car or rent one? Because we are located in a residential neighborhood on a corner lot, there is ample on-street parking. There are 3 spaces directly in front of the house on St. Charles Avenue and 4 along the side of the house on Washington Avenue. Because of the ease of use provided by the streetcar, most guests park their cars at check-in and leave them there until checkout. Tell me about the streetcar. How convenient is it? The St. Charles Avenue streetcar is the oldest, continuously operating street railway in the world. In 1985, it celebrated its 150th birthday and travels along a 13.2 mile route. There is a stop about 10 feet from our front gate (stop # 16). It runs 24 hours a day, 7 days a week. While you cannot set your watch by their schedule, they pass every 15-25 minutes during weekday business hours (6am- 7pm) getting less frequent in the evening until they pass 1 time an hour from 11pm- 6am. It costs $1.25 per person per direction ($0.40 for seniors with ID) and you must get off at the end of the line and pay again to get back onto the car. We do sell RTA passes for unlimited travel on the system that includes all buses and the Riverfront streetcars as well. They cost $3.00 for a one-day pass. Ask for them at check-in if you are interested. What is included in a continental plus breakfast? The breakfast served at our New Orleans bed and breakfast is set up for a 2-hour window from 8:30 am – 10:30 am every day. It consists of a bread item (bagels, croissants, etc. ), a sweet item (muffins, strudel, etc. ), toast, hard boiled eggs, yogurt, fresh fruit cups, a variety of cereals, juices, teas, and coffee. Please let us know before your arrival if you have any special dietary needs, so that we can accommodate you as much as possible. Special arrangements can also be made for an early breakfast if necessary. Can you tell me about your furniture in the rooms? What is a “plantation” size bed? All of the furniture in the house dates back to the turn of the century, over a span of +/- 30 years. A “tester” bed is a 4-poster bed with a full canopy. A “half tester” bed is a 2-poster bed with a canopy covering half of the bed.. A “plantation” size bed falls between a modern full and queen size bed. Because all of the beds are antiques, they are not a “standard” size. Each bed also has a feather mattress on it for extra comfort. a 15-minute streetcar ride or an $8.00 cab ride. 23 blocks to the corner of Poydras Street. This is a 10-minute streetcar ride and then a 5-block walk or an $8.00 cab ride. The New Orleans Convention Center? Depending on which end of the New Orelans Convention Center you need, 19 blocks to St. Joseph or 23 blocks to Poydras. This is about a 10-minute streetcar ride and then a 5 to 7 block walk respectively. This is a $10.00 cab ride. Tulane University and Loyola University, Audubon Park & the New Orleans zoo? 33 blocks. This is a 15-minute streetcar ride or a $10.00 cab ride. We are perfect for those looking for hotel or inns near Tulane University. All along the streetcar line. Within walking distance, there are several places beginning 6 blocks down St. Charles Avenue and along Magazine Street for 6 blocks down Washington Avenue for 5 blocks. It is 7-10 minute walk in either direction from the house. Yes, the Oak Alley Room of the Grand Victorian is handicapped accessible and fully compliant with the Americans with Disabilities Act (ADA). The mansion also has a wheelchair ramp. Yes. A stay at the Grand Victorian makes a great anniversary or birthday gift, or a wonderful thank you for that terrific client or business associate. They are available starting at $100 and in increasing increments of $50. Allow us to plan your special gift by calling (800) 977-0008 or use our online service. Purchase a Gift Certificate here.